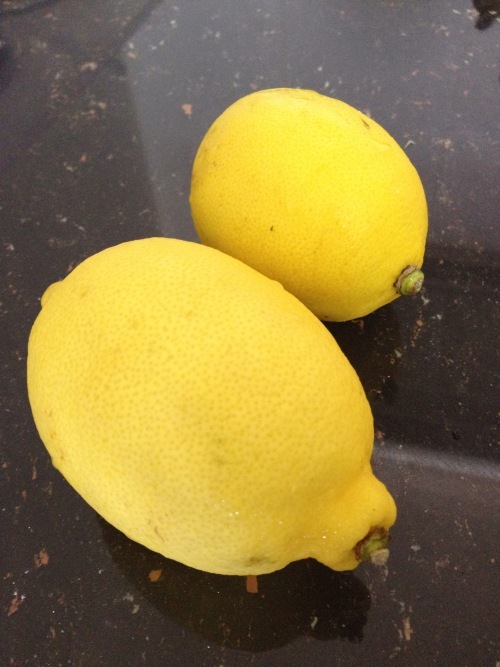 Each time, someone comes to visit me from the UK, I ask them to bring me over some lemons. At 75 cents each here, they’re a much dearer ingredient than their equally delicious greener counterpart, the lime. This time, I think that my sister brought me over a kilo of them; a much better suited present than the kilo of homegrown beetroot she once left in my fridge. So now, I have a treasure trove of lots of lemony lemons living in the bottom of my fridge. And so, I’ve begun to work through my favourite lemon recipes. Last weekend, I came across this one, from 2013. Don’t be put off by the name. It’s actually a really simple cake to make and makes an elegant dessert. 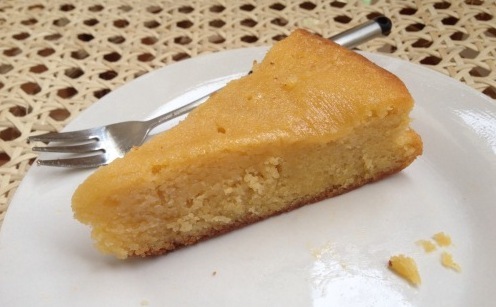 When I mentioned it to Caroline, my housemate, she decided that lemon polenta cake was her preferred dessert over Kampot Pepper Brownies. Actually, that Saturday evening, she declared that it to be her favourite of all my cakes that she’s ever eaten. I wasn’t so sure. I wanted rather a lot more tartness, than the original recipe was giving me. So, I changed the syrup to a drizzle, reducing the amount of sugar and replacing the icing sugar with caster sugar. The second time round, the lemony tartness complemented the sweetness of the cake beautifully. So, let me set the scene, if you are reading this blog for the first time. It’s June 2013. I’m preparing to leave one life behind and begin a new one in Cambodia. I’ve just finished working my last week as a Skills Programme Coordinator at the University of Warwick and in the midst of packing up my Redfern flat. I’m too busy to notice the misery and grief that will soon engulf me. Thus, I have a much more pragmatic and much less miserable outlook to goodbyes than in this later post. These last two weeks have been full of ‘last times’. I’ve been trying to acknowledge each one as they come round. It’s not a fully indulgent, let’s sit down and have a cry over them. I don’t really go for that kind of sentimentality. More of a passing nod to say – I saw you and I noticed. I realised that you know the last thing I’ve baked in each of my kitchens every time that I’ve moved. I think that I’ve chronicled each move with a recipe. The countless hours of mundane wrapping and packing into boxes, only made bearable by thoughts of food. Haha… Reminisce with me. There was the lemon and ginger cheesecake when I left Cryfield. Then I was up til the wee hours making pots of bramble jelly when I moved out of Heronbank. I made a valiant attempt at using up my bananas and created whiskey, chocolate and banana cake when I moved out of the Subwarden flat in Cryfield 3, which I affectionately refer to as my rabbit warren years. 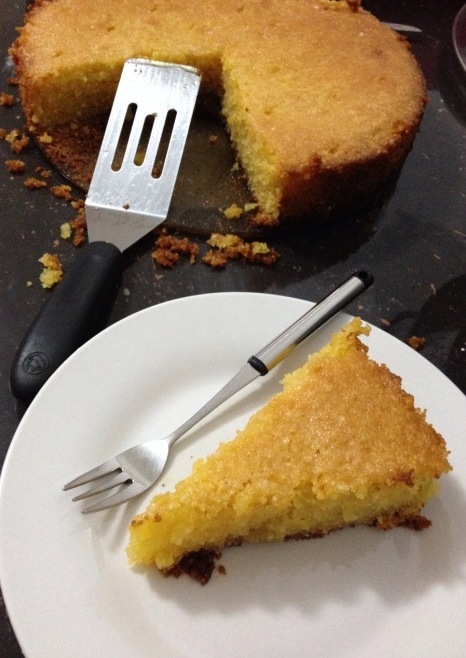 Finally, I have to to move out of Redfern and I baked lemon polenta cake. I’ve done better with each move. David worries less and less about whether I’ll get everything packed up in time for the removal men. This time I packed away my baking equipment and books the Sunday I finished work; a week before the moving deadline and the day before my CELTA course is due to start. Which leaves me sitting forlornly at my kitchen table, reminiscing about the huge amounts of baking I’ve done in this kitchen. I don’t know when I’ll be baking again in the next 4 weeks during my CELTA course and I feel bereft. 1½tsp baking powder – if you want it to be gluten free then use the gluten free variety. 1. Preheat the oven to 180°C, 350 °F, Gas Mark 4. Grease and line a 23cm springform round cake tin. 2. In one bowl, measure out the ground almonds, polenta and baking powder and give them a stir. 3. 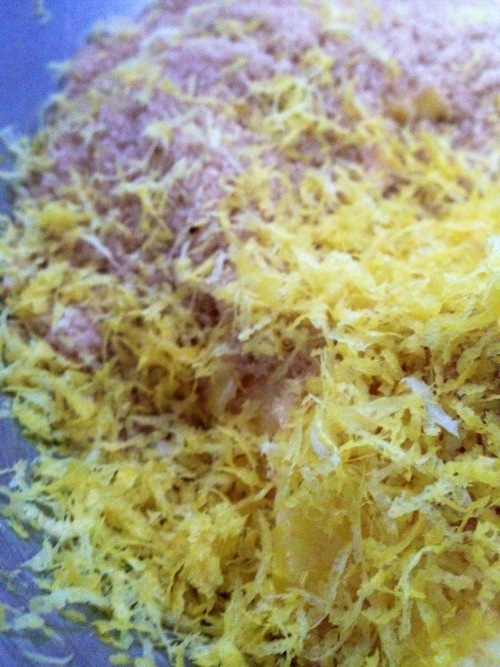 In another bowl, add the butter, sugar, salt and lemon zest. Cream them together, preferably with an electric mixer or a stand mixer, for a couple of minutes until the mixture changes colour and becomes light. 4. Add in an egg and mix. 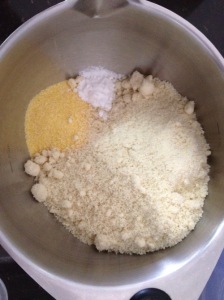 Then add a third of the dry ingredients from step no.2 All the time, keep on mixing. Alternate between adding an egg and dry ingredients. Nigella notes that you can make this cake entirely gluten-free if you don’t have gluten-free baking powder by beating all the ingredients really hard at that this point. 5. 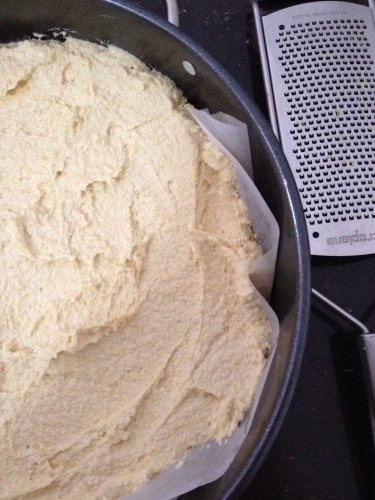 Splodge the mixture into the prepared cake tin and smooth it out with a spatula or a knife. 6. Bake in the oven for 40 minutes. 7. Meanwhile, make the lemon drizzle. Measure out the sugar in a bowl and then add the juice of two lemons. 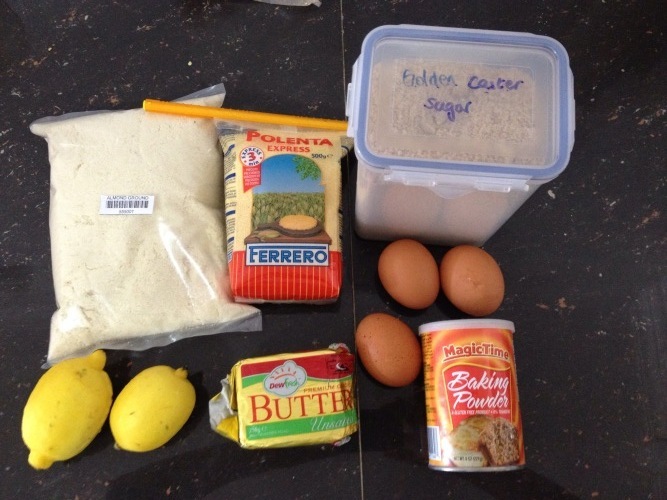 Stir together until the sugar dissolves in the lemon juice. 8. 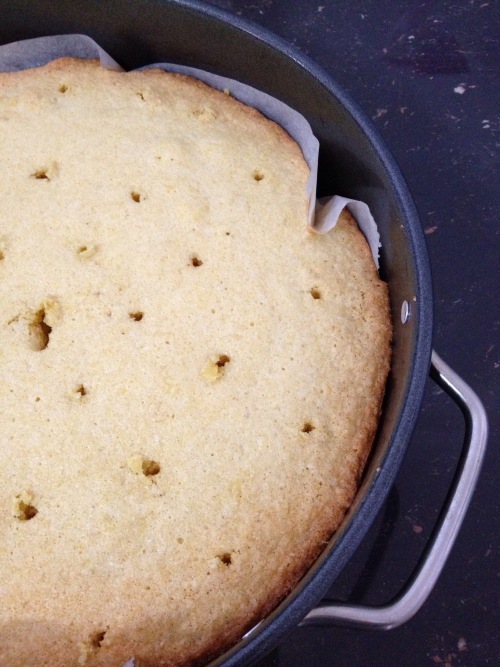 The cake is baked when it’s coming away from the edges, firm on top but still rather pale colour on top. Prick holes to allow the drizzle to seep through. As you can see, a toothpick can look rather unsightly. But who cares, when it’s this delicious. 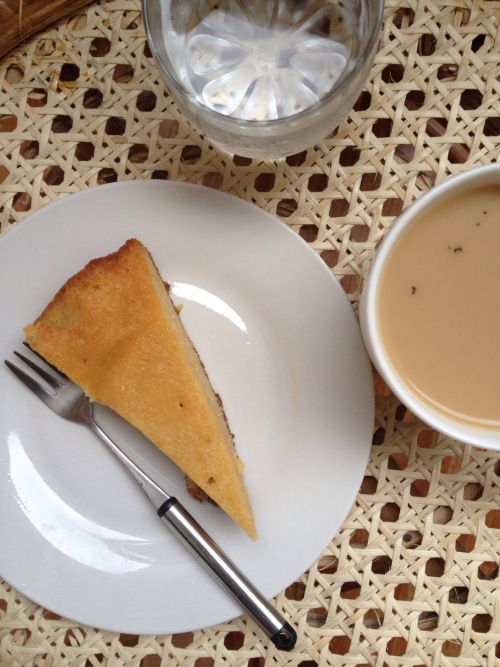 Pour the prepared lemon drizzle over the top of the cake. Leave to cool as long as you can bear in the cake tin before eating it. 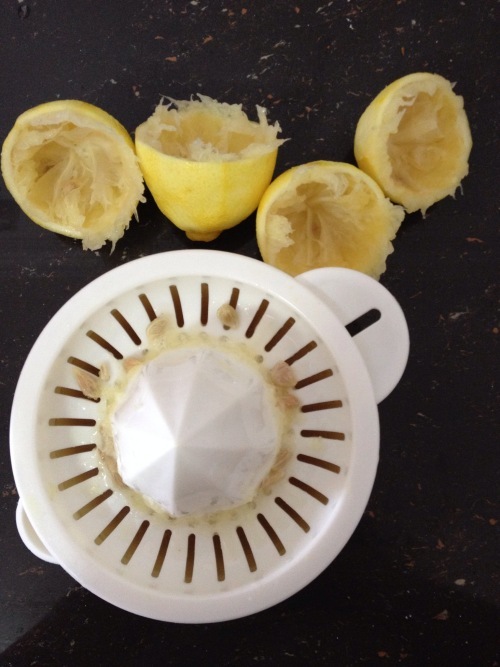 And I have to say – it’s even more delicious the morning after, when the lemons and almonds have had a bit more time to get to know each other and the flavours have melded together.